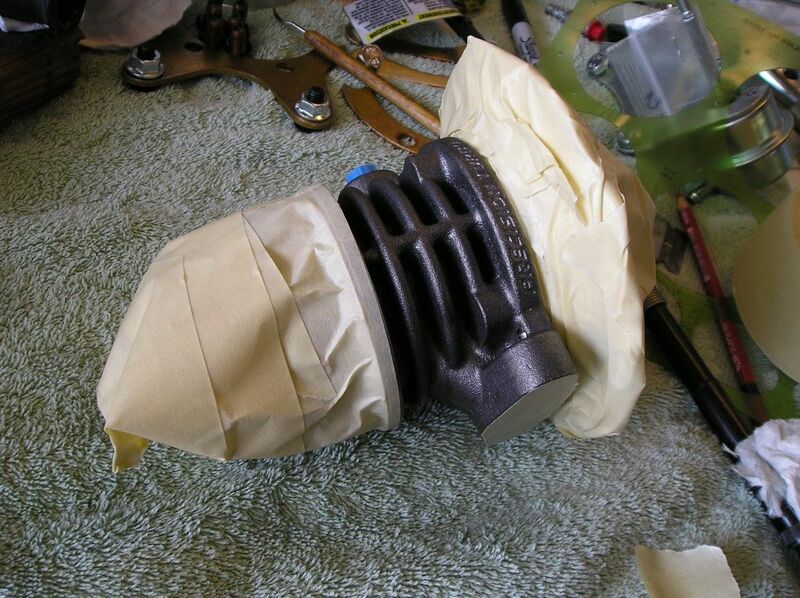 How I port and paint a turbo. Nothing worse than paying big bucks for a new hairdryer, only to watch it slowly rust away in your nice looking engine compartment. Since it should come apart to port out the waist gate hole anyways, this is the perfect time to paint it too. 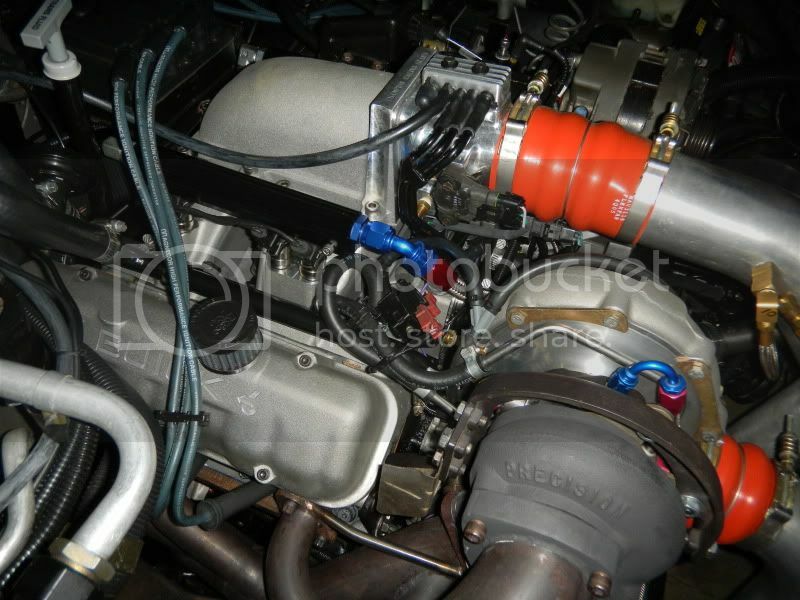 Here's the Precision 6265 dbl BB turbo on my GN that I did a few years ago. It still lools like new, even after many hundreds of street, strip, and dyno floggings. 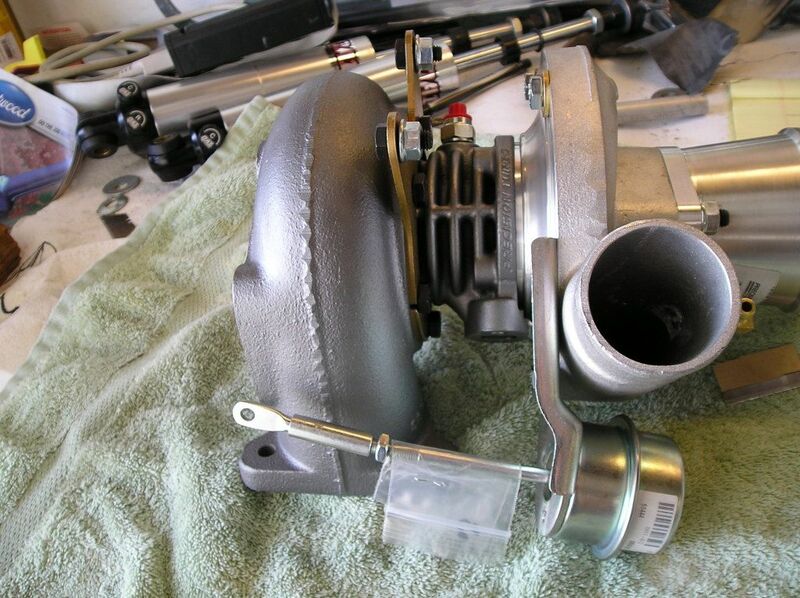 With turbo and downpipe on the bench, remove the compressor and exhaust housings. Use some Dykem blue around the waistgate hole. Scrape off some wax pencil or crayon on the edge of the puck. 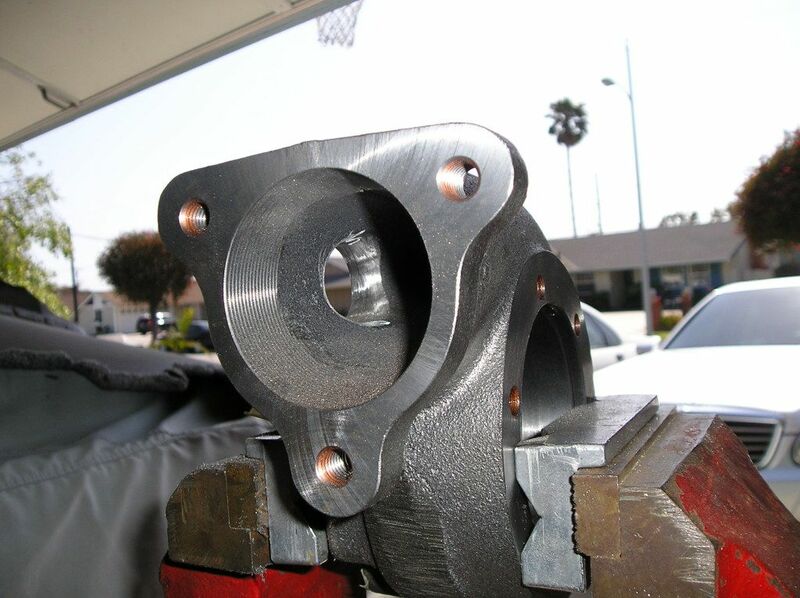 Bolt the downpipe to the exhaust housing and slap the puck against the hole area to make a mark. You can also reach your finger in through the exhaust housing intake and spin the puck while you have it in the closed position. 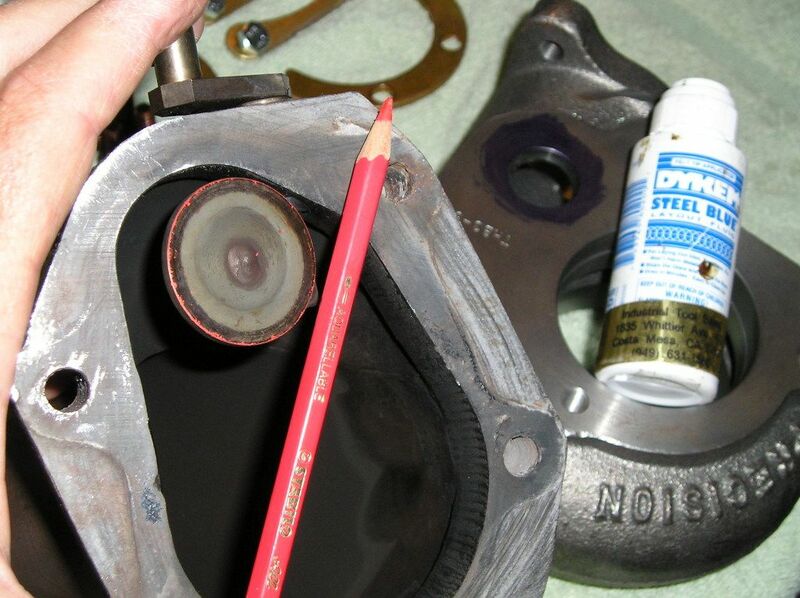 Remove the downpipe and darken the red mark, using a circle templet if needed. Note, puck will most likely not be centered on the factory hole. draw another circle 1/16 to 1/8" inside the puck circle. Chose your weapon for removing metal. The 90 deg. air drill shown here likes to jump around. 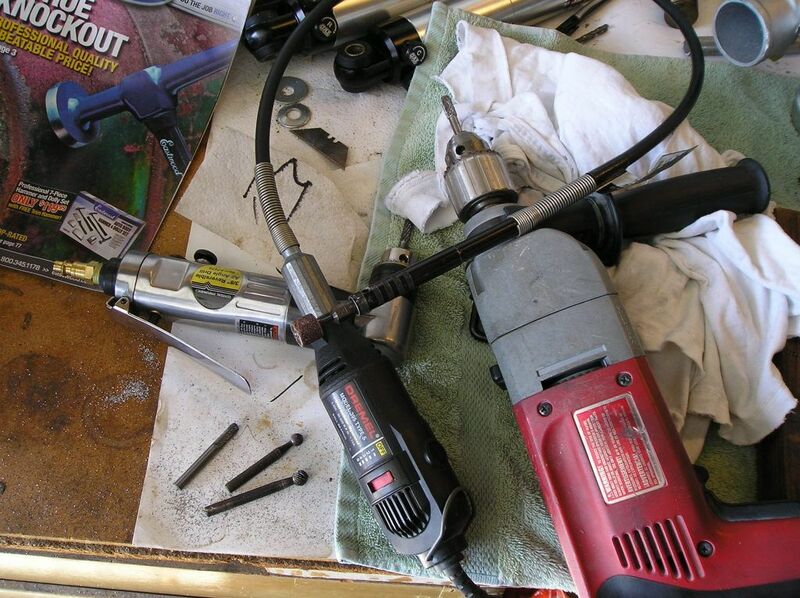 The big drill is very steady and gives you a good hanle to put some weight on. The little Dremmel tool is nice for finish work of smooting things out and getting around corners, as you'll want to round and smooth the inside corners to maximize air flow. It does make a huge difference. Next. Painting the center section and exhaust housing. Dyechem? Isn't that a lesbo that dyed all her hair. 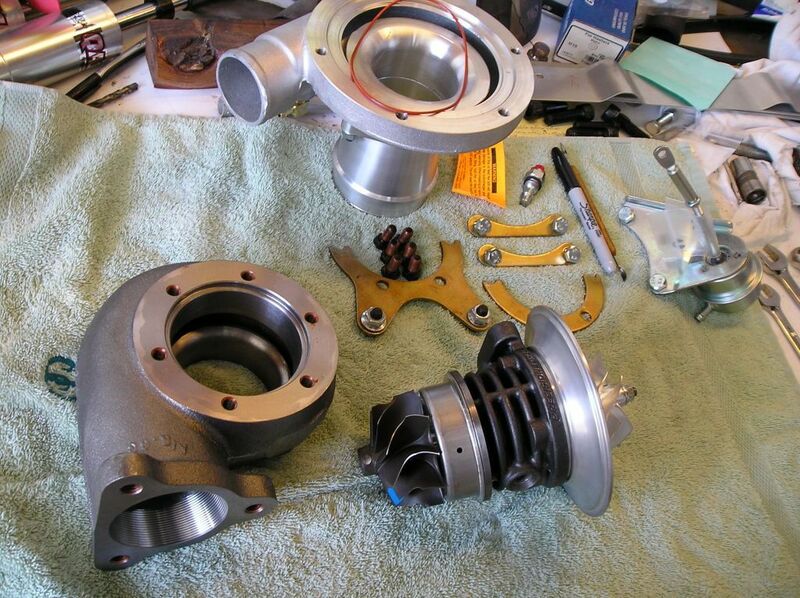 This can be done on a old or new turbo. If old, get out the wire brush. If new, you should just need to clean it with a degreaser. 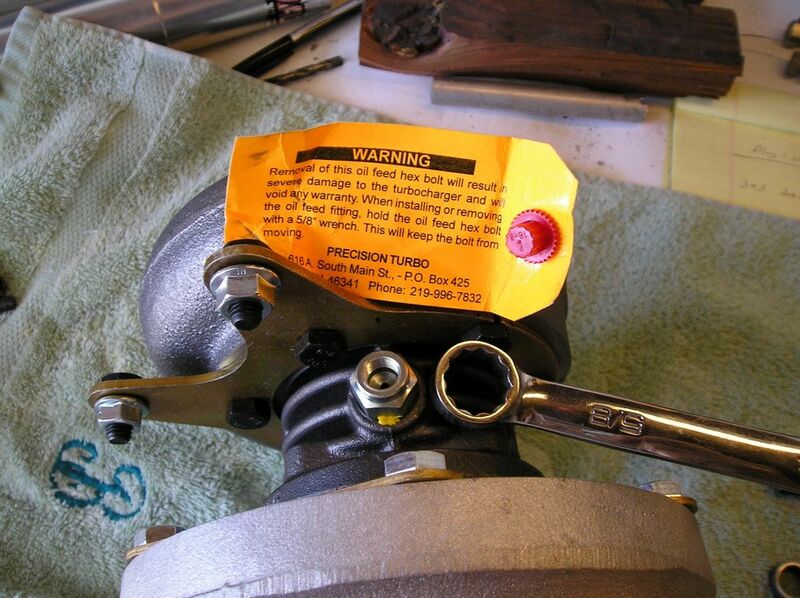 Note, if you remove the oil restrictor and break the seal on your new turbo, you will void the warranty. I decided to break the seal to do a cleaner paint job. However, I also run with scissors and jump out of perfectly good airplanes. So, be warned! 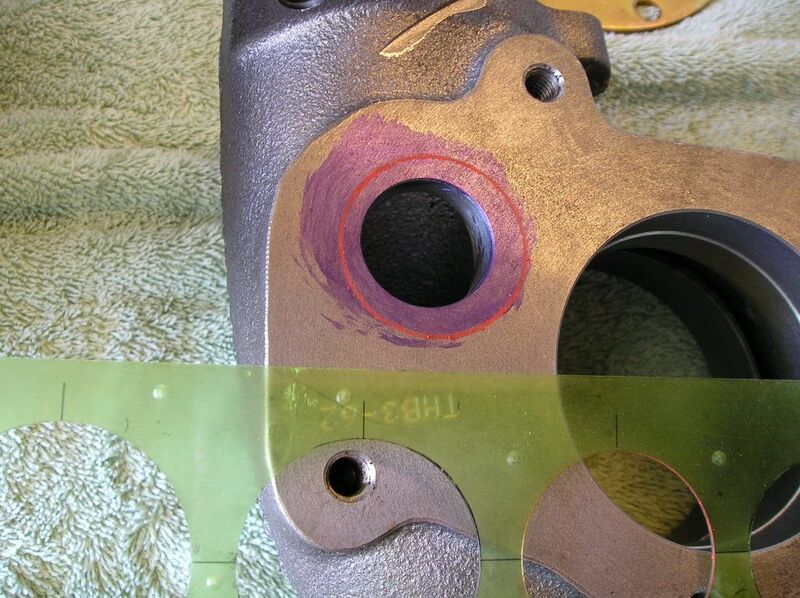 If restrictor is removed, install with blue locktight when done, as per Denis at Precision Turbo. Here's what I use to degrease and paint turbos. Let degreaser dry compleatly before paint. Paint. Start with light coats, finishing with heavier. This is a cast iron color paint. It should look the same before you paint it as it does after it's done. Be sure and tape off everywhere you don't want paint. Note, the compressor and exhaust wheels taped off. Here's the finished deal. It's a 6262 dbl BB that'll be going on John Seleeby's 87 GN soon. Here's what I did with the rusty old TA-49 on Gary Wells car. 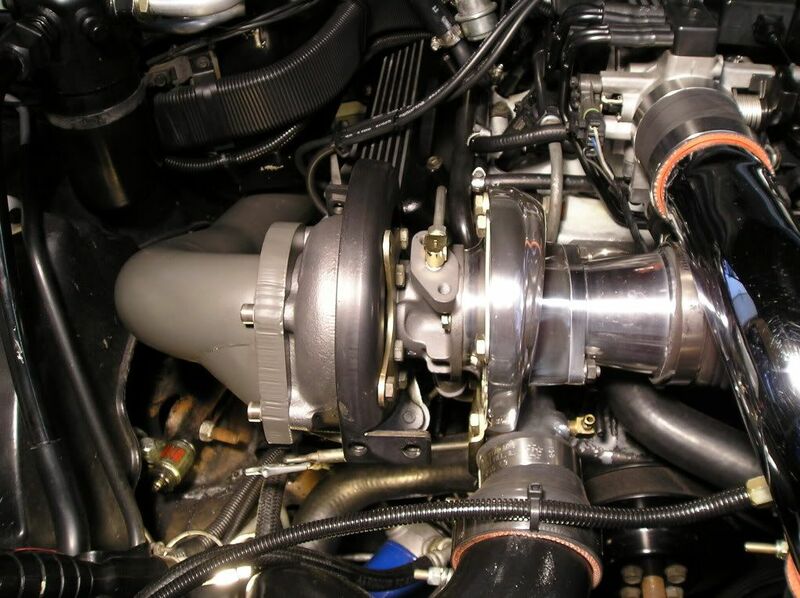 The thread is titled, "How I port and paint a turbo". I know that it's not the only way. If anyone wants to comment, or post their way of doing it, go for it. 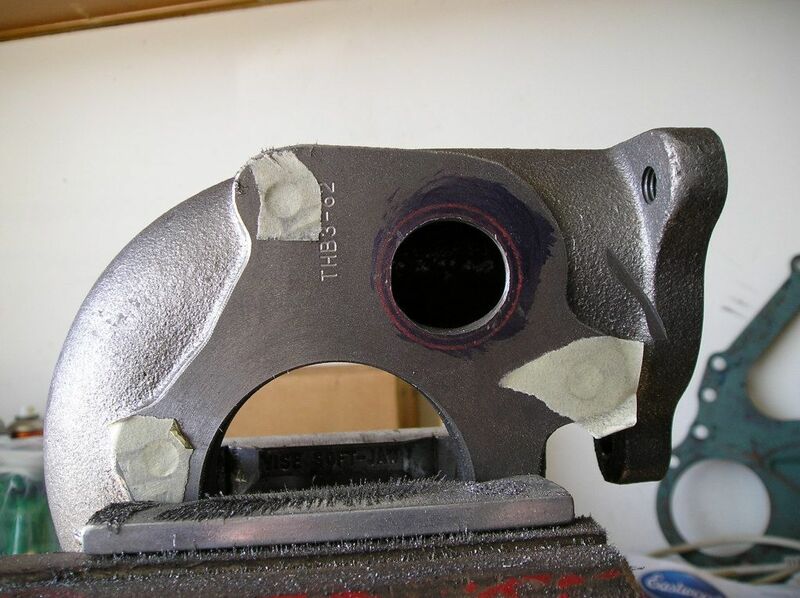 I posted this in the Turbo Section, because it's all turbo related and it seems we have "How do I port my WG hole" asked here all the time. If Mods feel that this should be a sticky, or better suited to the How to section, feel free to move it. 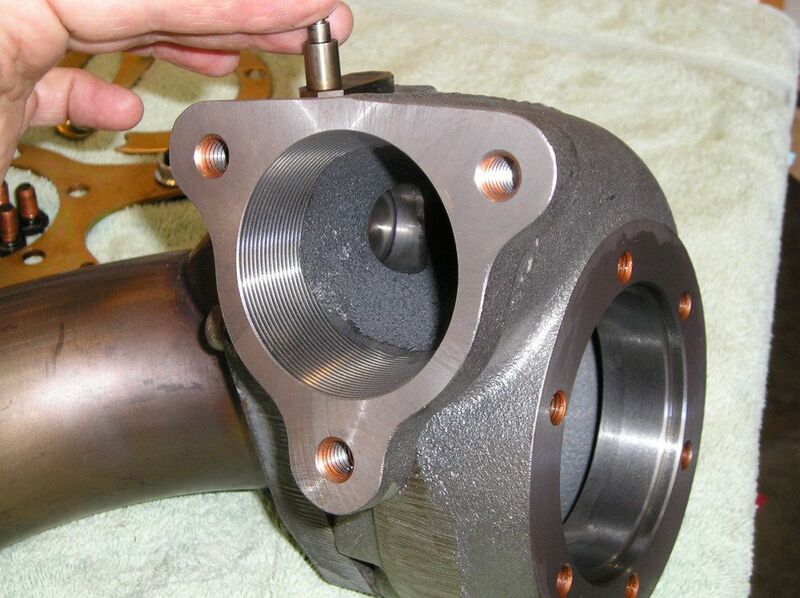 do all the new PTE turbos use o-rings on the compressor hsgs, or just TA hsgs? Good Job! I vote for the sticky! Every cast iron attempt at painting I've tried has turned to rust! Try it again....The 5" DP will keep the back pressure down, and the exh temps won't be so high..
hello; Nice clean work in all those photos. To bad your across the country. 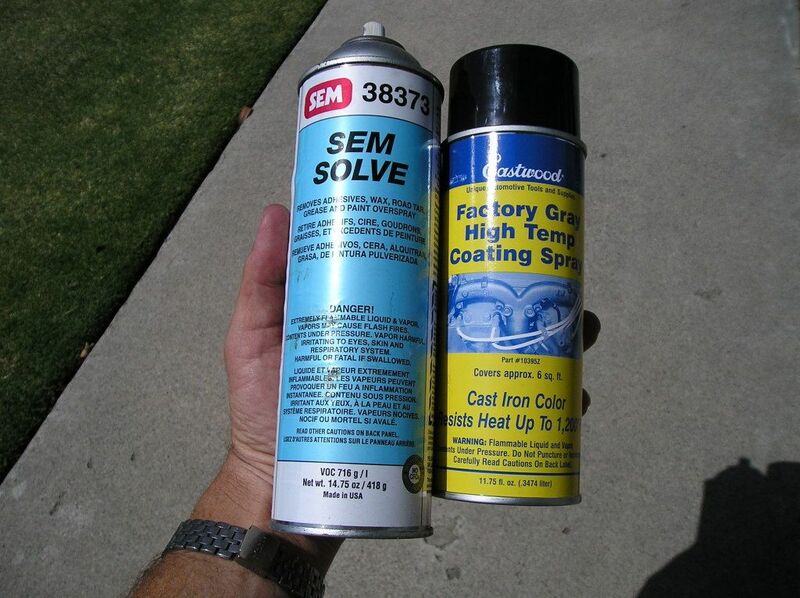 Instead of paint wouldn't a hi-temp coating be better? Very helpful. What paint (silver) did you use on the exhaust? 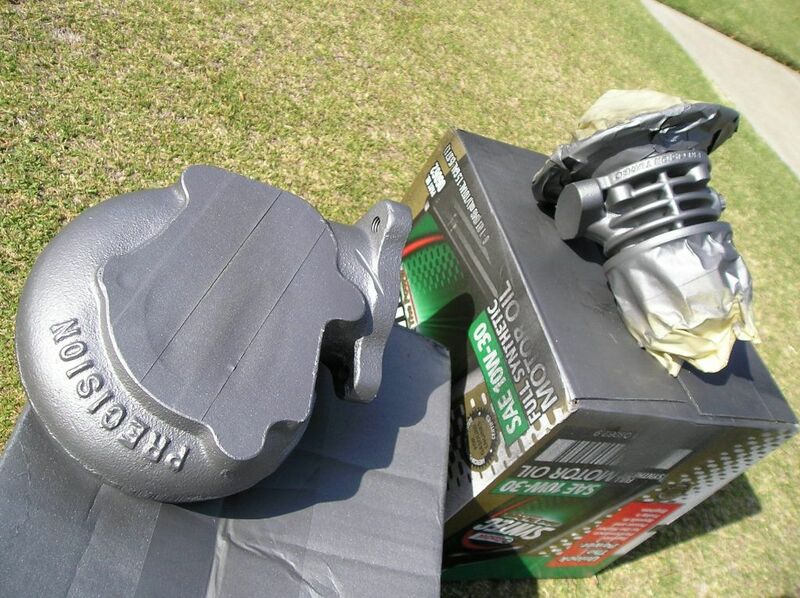 I've been using the ultra-high heat paint from duplicolor (autozone stuff). It looks nice for a few years, then needs to be scuffed up and repainted. Thank you Mike for doung so much for the GN community. Your expertise and knowledge go a long way towards the members who are less experienced but wanting to learn. Can't wait to install it!! Where do/can I get the cast iron color paint that you used? I have a new turbo that I am getting the compressor housing polished right now and I want to paint the exhaust housing before I run it. I learned about this stuff from my friend that has a high end body shop. I would like to warn people not to take that oil fitting off. When I did the BB cartridge shifted and the turbo would not go back together. I had to mail it to precision to put it back together. Also do not run and jump out of an airplane with scissors. Noted. When I talked Precision, they said that it would'nt be a problem with mine. 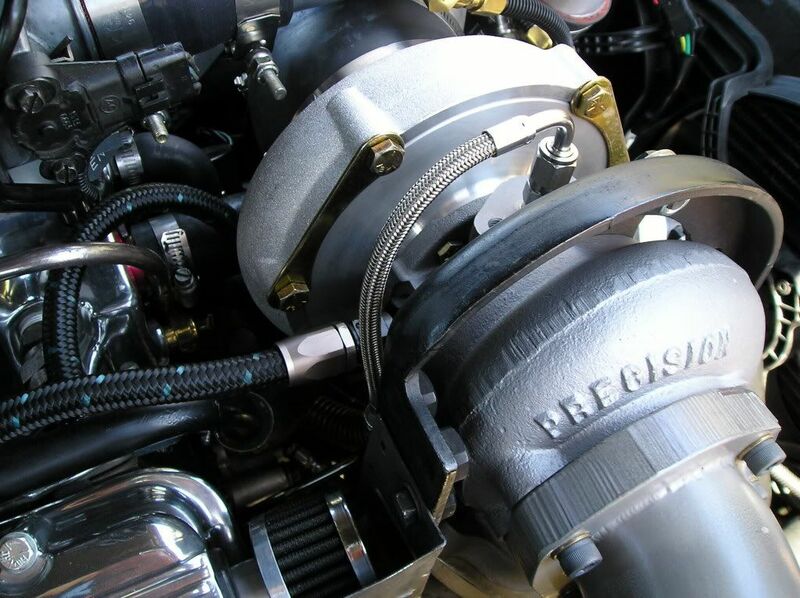 Maybe not all precision turbos are the same. It would be nice to get a clairification from Precision.